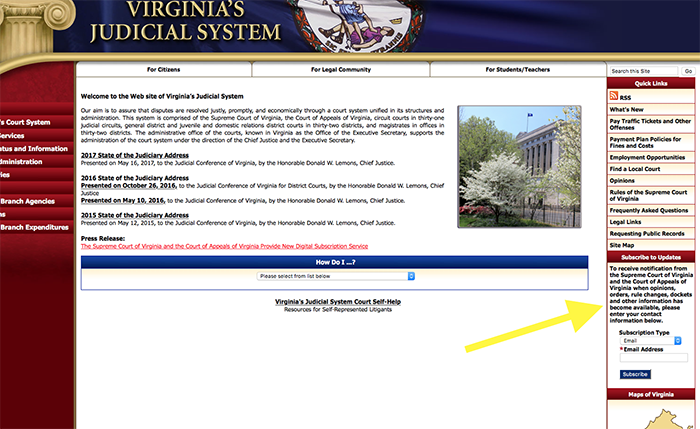 Members of the public can now sign up for a free service that helps quickly inform subscribers of Supreme Court of Virginia and Court of Appeals of Virginia opinions, orders, rule changes, dockets, events, and more. The service is easily accessible and simple to navigate. It can be found on the right column of the Supreme Court’s homepage. Virginia State Bar members are also encouraged to make sure that the email in their member portal is up-to-date, and that they are receiving the bar’s monthly newsletter with important rule changes and notifications.